Since the launch of Google Talk in 2005, Google has emphasized the importance of people using the company’s services to communicate with one another. In fact, Google thinks it’s so important, that it made more Google-branded messaging platforms than it knows what to do with, each one offering similar functions with minor tweaks. We’ve designed specific products for distinct use cases, so we don’t intend to have one app that does everything for everyone. We think we can better serve our users by creating products that function really well, and users can choose the product that best suits their needs. While this sounds good on paper, it also makes things bewildering for the user when it comes to sticking with one app for one function. For example, a user could use Google Duo, Google Voice, or Hangouts to make a phone call. Which one should they use? Why is one of them better than any other? Before we take a look at all the current Google messaging apps, let’s look back at Google’s messaging history. Google’s first attempt at a messaging application was arguably its best. It was called Google Talk (sometimes colloquially referred to as Google Chat or Gchat) and you could use it to chat with anyone on any platform, even if they didn’t have a Google account. The Gmail web portal had a browser-based chat box, so you didn’t have to install any software. There was an Android app, a Windows app, and even a BlackBerry app. However, Google Talk was based on an open-source protocol called XMPP. Google decided to drop support for XMPP and instead use its own proprietary platform for its new Google Plus social network, which launched in 2011. Both Huddle and Hangouts were born from that change. Google then killed Huddle and spun Hangouts off into its own, standalone app. Google hoped Hangouts would be the better, all-encompassing solution to communication by giving users the ability to text chat, video chat, and make calls all within one app. But Hangouts didn’t take, and soon Google started to splinter aspects of Hangouts out into separate apps, which created the messaging app mess we have now. Now, there are many apps on the Google Play Store that do messaging functions better than Google’s apps, which is crazy considering Google Talk and Gmail were the default messaging services for millions until Google killed off Talk. The seven Google messaging apps below are what we have now. Most everyone is aware of Gmail at this point. It’s a free, advertising-based service that allows you to send and receive email. You can use the Gmail app on your phone, the web portal at mail.google.com, or you can integrate your Gmail account into a third-party client, like Microsoft Outlook or Blue Mail. The web client supports instant messaging through an integrated Hangouts (more on that later). Google Voice is also integrated within the Gmail web portal. This makes the web portal a robust center for you to control multiple messaging experiences, especially with the recent redesign. However, the standalone Gmail mobile app only supports the email functions of Gmail. Best use: Use the Gmail app for your email, especially if you like having lots of control over your workflow. Google introduced Inbox by Gmail in 2014 as an alternative to the Gmail app. The design and workflow of Inbox are different than Gmail, with Google’s AI program taking more control over the organization of your messages. Unlike Gmail, you can’t create a new account with Inbox; you use a pre-existing email account within the Inbox client. Some of the features born in Inbox — like the Smart Reply feature — have made their way to the native Gmail app. But some people prefer Inbox over Gmail because of its simplicity and the fact that Google’s AI handles a lot of the legwork of keeping your Inbox clean and organized. Just like the Gmail mobile app, the Inbox mobile app only lets you do email. However, unlike the Gmail web portal, the Inbox web portal also only allows you to do email, although your call logs and SMS messages from Google’s other services appear in your Inbox folders. In general, Inbox is just a different version of the Gmail interface, which makes one wonder how long the app will last. Best use: Use the Inbox by Gmail app for your email if you’d rather not spend the time to keep things organized for yourself. Okay, this is where things get really confusing. Hangouts started as a feature within Google Plus that was strictly for video chats. However, facing competition from the likes of Facebook Messenger, WhatsApp, and others, Google needed a standalone service to grab some market share. So it ported out the Hangouts feature into its own app. Now, using Hangouts, you can instant message people, conduct video chats, and place audio phone calls. However, you can’t send SMS or MMS messages, which prevents Hangouts from being the all-encompassing messaging app from Google. But Hangouts itself isn’t long for this world. Last year, Google announced that it would split Hangouts into two different products: Hangouts Meet and Hangouts Chat. Hangouts Meet will encompass the video conference aspects of Hangouts and Hangouts Chat will focus on the instant messaging side. Currently, the full-featured versions of both Hangouts Meet and Hangouts Chat are reserved for G Suite customers only. The vanilla Hangouts is still available on the Google Play Store, but who knows for how long. Best use: Hangouts is honestly great at everything it does. However, as noted at the beginning of this article, Google doesn’t want a one-size-fits-all messaging app, so who knows how long we’ll have Hangouts. We're halfway done! Here are some more app lists! 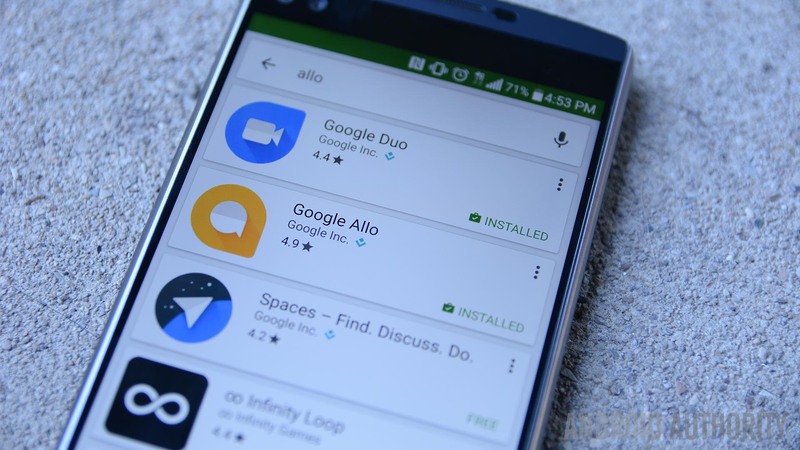 After Google gave up on Hangouts becoming an alternative for WhatsApp users, it put out Google Allo, which is only about instant messaging. The big selling point for Allo is the fact that it integrates Google Assistant features into your chats, giving you access to things like Smart Reply. To use Allo, you have to connect it with your phone number, which limits you to using Allo only on your phone. There’s no tablet or desktop support for Allo, which is annoying. However, even though you can instant message with people using Allo, you can’t use the app as an SMS or MMS client. That means that, even though you connected your phone number to the app, you still have to text people using one app and then IM them using Allo. What’s super annoying about this limitation is that Allo does, in fact, give you the ability to send SMS texts. But the person who receives the message gets it from a weird, Google-owned proxy number, not your own. Oh, and one last thing: Google is likely doing away with Allo by integrating RCS messaging into Android Messages through a new program called Google Chat (more on that later). There’s nothing solid as of yet, but we’ll likely see the end of Allo in the near future. Aside from these significant caveats, Allo is a good app. What it does (instant messaging) it does well, with a colorful and easy-to-use interface with a lot of cool features. Best use: Use for instant messaging only, and only use it if you have to. Allo is not long for this world. Along with the split of instant messaging from Hangouts into Google Allo, Google created Google Duo to handle video chats. At first, video calling is all the app did. Now it can also handle audio calling. However, as usual, there are some limits. Using Duo, you can not only place video calls to people using your Google account, but you can also call other mobile numbers. If the person you call has Duo installed on their phone, you can video/audio chat with each other for free. However, if you place a video call with an Android user who doesn’t have Duo installed, it defaults to a regular audio call. After the call, the user is encouraged to install Duo. If you video call a person who’s using a non-Android device like an iPhone, and they don’t have Duo installed, the call doesn’t go through at all, and you have to contact them through other means. It’s also worth mentioning that it is possible — although tricky — to use Duo with your Google Voice number instead of your SIM number. However, it is far easier to use your SIM number with the app. Best use: Google Duo is great for video calls with other users who also have Duo installed. If you’re trying to communicate with someone who doesn’t have Duo, things get really complicated, and it’s probably easier to just call them using your phone’s dialer or use another shared app. Currently, Android Messages is the only app from Google that fully supports SMS and MMS texting using your SIM card number. And wouldn’t you know it, that’s about all this app does. If you are lucky enough to be a Project Fi subscriber, Android Messages supports RCS messaging, which makes texting more like instant messaging (à la iMessage) (Savvy readers pointed out that this is not entirely true. Fi does support Smart Reply exclusively between Fi subscribers, which is an RCS-like feature. But full RCS implementation won’t happen for a while). However, if you’re not on Fi, only certain mobile carriers support RCS messaging through Android Messenger. In the future, Android Messages will likely support RCS messaging for all, as well as the ability to text from your desktop using a web portal. These features are in development and exist as rumor only at this point. (This has now rolled out as Android Messages for Web and RCS will arrive in Messages under the Chat banner). When those features roll out, it will make Google Allo essentially irrelevant. That’s why Google is moving the Allo team to work on Google Chat instead. 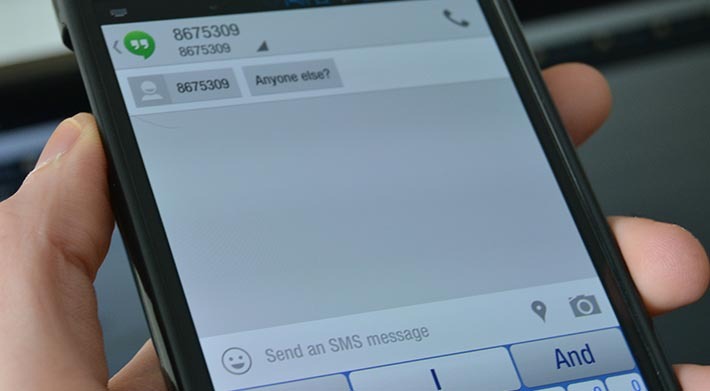 Best use: As of today, the only reason to use Android Messages is to send SMS and MMS messages. In the future, it might be your one-stop shop for messaging on Android. Maybe. Google Voice is one of the older applications on this list. Using Voice, you can sign up for a free phone number from Google and use it to make free phone calls and send free text messages. If you download the Voice app from the Google Play Store, you can use that app to make phone calls, send SMS (including group MMS), and view and listen to voicemail. However, you can only do these things with your Google Voice phone number. In other words, if you wanted to send a text from your Google Voice number and then send a text from your regular SIM number, you would need to perform both tasks in two different apps. Same with phone calls and voicemails. However, you can forward your Google Voice calls and messages to your SIM number, which then lets you control everything from one app. However, that app won’t be Google Voice. Best use: As it stands, Google Voice is perfect for people who use their Google Voice number as their primary number. For everyone else, it’s probably easier to use your phone’s built-in dialer for calls and Android Messages for texts. The upcoming Chat service won’t be a standalone app, but rather a behind-the-scenes system that is incorporated into Android Messages. After years of trying, Google finally gave up on trying to create a messaging app for Android that could compete with Apple’s iMessage. Instead, it is getting mobile carriers to change the way they host texting, and that new method is called Chat. At its most basic level, Chat is just a code word for RCS messaging, which you can read more about here. The idea is that carriers will “turn on” Chat support, and then Android users will be able to communicate using RCS messaging with other users who also have Chat support. If either end of the conversation doesn’t support Chat, the fallback will be traditional SMS and MMS. Google knows that releasing yet another messaging app would be futile, as it has already proven that making a chat app work well is exceptionally difficult for the company. With Chat baked right into Android Messages, you can expect Google to push Android Messages hard over the next few years. You should ignore Google Allo as there’s no telling when it will be dismantled entirely, and you should only use Google Voice if you have a Google Voice phone number (and use it a lot). Using Hangouts as your instant messaging app is fine for now, but even that service may get dismantled once Chat starts to take hold. Someday, Google might stop fighting it and release a single app that can handle your instant messaging, video calls, and texting all at once. Considering you can already do that with the Facebook app as well as WhatsApp — and people really like to use those platforms — proves that Google is just being stubborn.